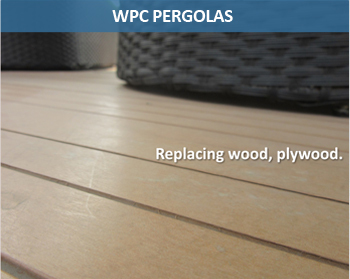 DECK FLOOR is a well acquainted WPC product variant globally. Generally known as WPC Decking it is widely accepted and being used for outdoor living applications. It is used on walkways, Platforms, terraces, traffic squares, courtyards, garden coverings, swimming pool surroundings, river sites, pond sides, water areas, dam areas, corridors etc. This is an all weather product. Decency of DECK FLOOR gives typical natural touch to overall ambience where it is used. Technically, it reduces sunshine reflection and absorbs UV radiation. It can be applied across water drainage areas because of air permeability. Socially, it is a green product that protects environment with its natural characteristics of anti-water, anti-fungus & anti-termite.